Now, while we know that mud-plugging isn’t to everyone’s tastes we ‘ere at CB-Net would heartily suggest you give it a go. Not only is some gentle off-roading something that keeps your skill set up during the winter months (sliding a low-powered trail bike is great for getting used to a motorcycle moving underneath you) but it’s also ruddy great fun. The Yamaha came out way back in 1975, but was still around in 1989… so it was the perfect template for Suzuki to try and copy. 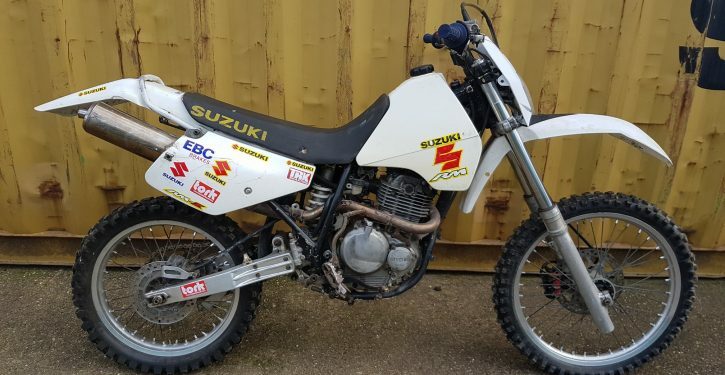 Britain’s off-road fans had wanted something gutsy and four-stroke and that wasn’t too heavy when they were picking it up out of a bog: perhaps the DR350 could fit the bill as an XT replacement? OK, so we’d seen the likes of Suzuki’s SP370/400s and Honda’s XL250 as well as Yamaha’s DT175MX and XT350 ‘diesel’, but there was still a gap in the market for something easy-going, strong and suitable for most off-road action. The DR350 really seemed to fit the bill, the 349cc oil/air-cooled (Suzuki Advanced Cooling System/SACS) Single Over Head Cam motor produced 34bhp and 26-ft/lb of torque – the bike put the power down through a six-speed ‘box and a top speed of 85mph could be attained on the Tarmac. Out on the trail the 130 kilos of lard meant that it could be picked up by even the most knackered, mud-spattered enduro virgin, while the 21-inch front and 18-inch rear meant it had the optimum set-up for the rough stuff. It innovated, too, being the first bike to be imported into the UK with an aluminium swingarm that was put together using adhesive instead of traditional welds. The rumour was that the all-round brilliance of the bike was thanks – in part – to US off-road expert Al Baker helping out with the research and development of the bike. As it wasn’t broke, it wasn’t fixed. Perhaps the biggest improvement came with an electric boot for the bike in 1994. Eventually, in 2001 noise/emissions meant that a newer, DR-Z400 had to be developed. An 11-year run was pretty good, all told! Here’s our list of colour/variations. Please remember we are fallible, but – more importantly – that not all markets had all models and some older machines were sold the year after. US models will also vary compared to Europe/UK. 1990 DR350S – Suzuki year code L: All have a white tank and headlight surround. Frame, seat cover, hand guards and fork gaiters in either yellow or blue. Grey/blue decals to side-panels and headlight surround. 1991 DR350S-M: Small changes/similar styling. Yellow/white with orange/red zig-zag graphics or blue/white with green/blue graphics. 1991 DR350: The ‘no S’ DR350 was an off-road dedicated version now fitted with plastic tank as opposed to DR350S steel tank version, updated carburettor and suspension and off-road-orientated tyres. 1994 DR350SE (Suzuki model year-R): This debuted a ‘new’ electric start! 1995 DR350-S: Both 350 and 350 SE models available. Yellow/white model runs black chassis; Blue/white model runs blue chassis. Yellow/purple or blue/red/orange DR/350 decals respectively. 1996 DR350–T: Identical to the 1995 versions. 1999 DR350-X: Again, 350 and 350SE models available. Both frames are now black with more restrained graphics. The 350 runs black/yellow seat, SE runs black/blue. All side panels now read 350. 2000 DR350-Y: as previous year. 2001 DR350-K1: The final model year for the ‘old’ 350. Hand guards now grey/black instead of white. Same graphics as 2000: black grey seat cover, black side-panels and tank.